If you’re temporarily paid to do something, would that change your motivation or interest in doing the same thing when you’re not paid to do it anymore? University of Buffalo’s Indranil Goswami, a graduate of Chicago Booth’s PhD Program, and I investigated this long-standing question, which I’ll get to soon. But first, some background. Psychologists and economists have long debated the effectiveness of incentives. From the viewpoint of economics, it’s almost definitional. Much of the empirical research in the field is about how incentives—overt, hidden, and even perverse—influence and explain people’s actions. While this view can be summarized simply as “incentives work!” identifying what the incentives are can be tricky, and the definition of what constitutes an incentive has been broadening. University of California at San Diego’s James Andreoni, for example, in 1989 defined the “warm glow” feeling that a person may get from donating to others as an incentive that can explain altruistic behavior. Psychologists tend to think in terms of internal mental processes and motivators, and have historically been skeptical of external incentives, particularly monetary ones, which they see as impure. External incentives, they believe, interfere with people’s true, or intrinsic, motivation. Which brings us to one of my favorite papers, a comprehensive review in 1999 by University of Rochester’s Edward L. Deci and Richard M. Ryan and McGill University’s Richard Koestner of how incentives affect intrinsic motivation. They looked for experiments that tested how motivated people were to do a task without compensation after having been temporarily paid to do the task. In the paper, Deci, Koestner, and Ryan painstakingly gathered up the research, including unpublished studies (in order to deal with publication bias); categorized the differences in experimental methods; and summarized the average findings. They examined the free-choice paradigm, in which participants are paid to do an activity such as drawing and then are put in a situation in which they could do more of the activity if they chose, but with no further compensation. Their decision about whether to, say, draw more is compared with the same decision among people who were never paid to draw in the first place. On the basis of the 101 studies they compiled, it looks bad for incentives. Participants who were paid to do the activity did less of it when the payment was no longer available than participants who had never been paid. From a classical economics perspective, this may appear weird—if you like drawing, you should draw, whether or not you were previously paid to draw. To many psychologists, however, the reason seems clear: paying people changed how they viewed drawing, undercutting the intrinsic motivation that made it fun in the first place. The experiments varied a lot, and so did the results. Verbal rewards such as praise had positive effects on subsequent motivation, at least for college students. The negative effects were driven by tangible rewards, such as money, in situations where participants were paid conditionally—that is, they earned a reward only when they tried the activity, completed it, or achieved a particular performance in it. He went on to talk about grades as problematic incentives, and he went further in his book, writing that verbal praise is coercive and should be avoided because it contains an implied threat to withhold praise in the future. But in Deci, Koestner, and Ryan’s meta-analysis, verbal rewards had no negative effect on children’s subsequent motivation, and even tangible rewards had no postreward effect when the reward was unexpected. The Oprah Winfrey Show followed up with an experiment of its own that yielded a somewhat implausibly strong effect. A representative from the show paid some students to do puzzles. When the representative left the room, the students who had been paid lost interest in the puzzles, while the students who hadn’t been paid did not. Kohn characterized this result first in terms of an inference-based theory of intrinsic motivation before circling back to the control-versus-autonomy account. “If the kid figures ‘they have to bribe me to do this,’ then ‘it must be something I wouldn’t want to do,’ so the very act of offering a reward for a behavior signals to somebody that this is not something interesting,” Kohn said. Tests of incentives in real-world settings all find either no long-term effects or positive long-term effects. He was talking about the overjustification hypothesis set forth by Stanford’s Mark R. Lepper, David Greene, and University of Michigan’s Richard E. Nisbett in 1973. However, most of the experiments in which this has been tested involved young children, particularly preschoolers. There’s something a bit odd to me about the idea that the teenagers on the show were unable to judge how interesting the task was on their own, without making those kinds of more-remote inferences. We’re left with the admonition that in the long run, rewards will backfire and harm motivation, for both teachers and parents. As Oprah said, “You have to change the way you think about parenting!” But notice how far the broad advice being given to parents and teachers is from the nuanced differences between incentive strategies described in the 101 studies reviewed. Perhaps the most comprehensive experiments to test these ideas in a real-world setting were done by Harvard University’s Roland G. Fryer Jr. Overall, his results suggest little effect, positive or negative, of paying schoolchildren for their performance, such as for getting high test scores. However, he also conducted two large-scale randomized in-school trials that tested rewards for students’ efforts, for the underlying behaviors that could foster success in school. In Dallas, second-graders randomly assigned to the treatment condition were paid $2 for each book they read and passed a quiz on. In Washington, DC, some sixth-through-eighth-graders were paid for other educational inputs, including maintaining their attendance record, exhibiting good school behavior, and handing in homework. Paying kids to read books yielded a significant improvement in the Dallas students’ reading comprehension, a marginal improvement in their language scores, and a positive but insignificant improvement in vocabulary scores. In Washington, DC, the incentives yielded a marginal improvement in reading and a nonsignificant improvement in math. What happened when the incentive program ended? The psychological theories we’ve been discussing would predict that the kids will be worse off. Instead, Fryer finds that the positive effects were reduced by half and were no longer statistically significant. The benefits did seem to fade when the incentive ended, but there is no evidence that the outcomes were worse than they would have been if the incentive had not been offered. Three other studies with older students at the high-school and college level actually find some positive effects of education incentives that significantly persisted after the incentive ended. This brings us to Goswami and his research. Goswami, who wrote this up for his PhD dissertation, reviewed 18 field studies across a variety of domains, including completing an education, stopping smoking, losing weight, going to the gym, sticking to a medical routine, and working productively. All 18 of the studies measured people’s total behavior in a period after the incentive had ended, and they find either no long-term effect or a modest positive effect. Not a single study suggests that study participants, compared with those who didn’t receive any incentive, had worse outcomes when an incentive was offered and then ended. Where was the long-term harm? Motivational theories and research suggest that incentives reduce intrinsic motivation, and lower task engagement. But tests of incentives in real-world settings all find either no long-term effects or positive long-term effects. Goswami tackled this puzzle. Prior studies generally only measured people’s behavior right after the incentive ended, so he designed a test to see how motivation to engage in a task compared before, during, and after an incentive—and how it changed over time. Round 1: Participants chose eight times between math problems and videos. Round 2: Participants chose 10 times between math problems and videos. However, while half the participants were offered no incentive, the other half were offered 5 cents for every correctly solved problem. These participants were told that the incentive would apply only in that round. Round 3: In this key test, participants, offered no incentives, chose 12 times between math problems and videos. Participants given an incentive in Round 2 would probably do more of the math problems while the incentive was available than people not paid to do math. But what would happen in Round 3, when the incentive was no longer available? According to the psychological theories, participants who were never paid would have their intrinsic motivation intact, and would keep doing the math to the degree they found it interesting. But for participants paid to do math during Round 2, the math task would be different: either it would no longer provide autonomy or they would have inferred that it was an uninteresting task—and wouldn’t want to do it anymore. So the results would be predicted to look like the chart below. In a study of people’s intrinsic motivation, the researchers find that creating incentives to get people to choose less-desirable tasks could work pretty well. If asked, Kohn would presumably endorse the no-payment condition—sure, the payment gives us a short-term increase in the math task during Round 2, but at what cost to long-term motivation? Economists would tend to disagree. Incentives should increase the number of math problems participants do when they’re being paid, but why would it have a negative effect afterward? Once the incentive ends, participants should go back to doing as many math problems as they enjoy, as if the incentive had never happened. Or, if the incentive actually helped them improve at the task by getting them to practice more in Round 2, maybe they would continue to do a bit more than they had been doing before. Goswami conducted a series of experiments, varying multiple factors, and with nearly 1,100 participants. He finds that in the first round, the two groups chose the math task at the same rate. In the second round, participants who could earn money for solving the math problems did a lot more math problems. That makes sense. But in Trial 19, when the incentive ended, participants who had been paid to do math were suddenly a lot less likely to choose the math tasks. They wanted to watch a video, not only more than they had before, but also more than the participants who had never been paid an incentive in the first place. It looks like intrinsic motivation was reduced—but only for a while. This effect was weaker in Trial 20, and the difference was effectively eliminated by Trial 21. A minute and a half or a mere three choices later, the story had changed. Whether or not a participant had been paid an incentive didn’t affect his willingness to do math rather than watch videos. After a few more choices, the pattern actually fully reversed, and the participants who had been paid before did more math problems, for free. In a sense, both sets of findings from prior research were vindicated. Immediate negative effects on behavior after the incentives were withdrawn had been found in previous lab experiments and were found here too. On the other hand, as in the field studies, there was no overall negative effect. The results are inconsistent with the dire warnings about incentives. Providing a temporary incentive can yield a boost in behavior while people are being paid, and only a small and brief decline afterward. Maybe incentives work pretty well after all. Maybe the theory that paying people would supplant their intrinsic motivation is mostly right, just wrong about the degree and duration. Maybe intrinsic motivation is reduced but bounces back after people have a little time to forget about the payment. Or maybe giving people the opportunity to make a few choices on their own without any external influence resets their intrinsic motivation. But maybe the theory is wrong about the effects of payments. Perhaps people are trying to manage the eternal trade-off between effort and leisure over time. If they want a mix of both, they invest in more effort when they have a good reason to do so. And when the incentive is gone, it’s an opportunity to balance it back out by taking a break. 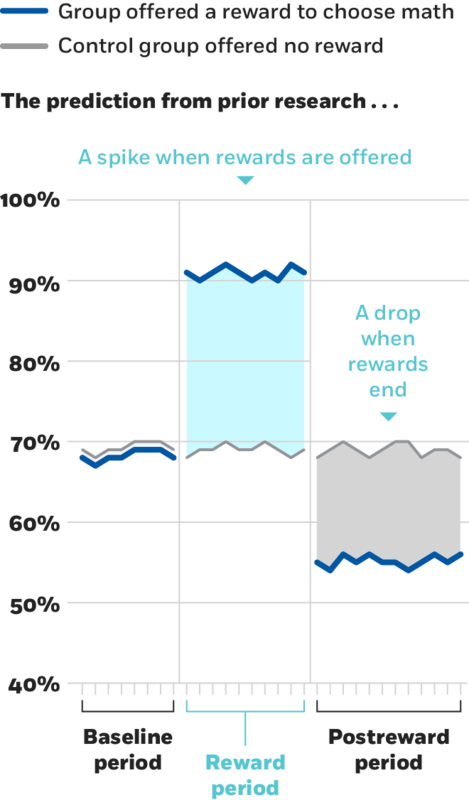 More-generous payments resulted in no temporary drop in motivation when rewards ended. Goswami gave people different kinds of breaks after the incentive ended. He finds that giving people a brief break eliminated the initial postincentive decline, but only if the break did not involve difficult choices. Giving people a little leisure made them willing to dive back into the math problems. How about a more direct test? The intrinsic-motivation theory predicts that the more intrinsically motivating the task, the more pronounced the negative effects of incentives will be. Goswami varied which task was incentivized, paying some participants for every video they watched and others for every math problem they solved. After being paid to do math, participants wanted a break and initially watched more videos. But contrary to the intrinsic-motivation theory, participants paid to watch videos showed no difference in their postpayment choices. Perhaps the most direct test came from simply varying the amount of the payments. According to the theory, the larger the incentive, the more controlling it is, and the more damage is done to intrinsic motivation. However, paying participants a high amount led to no immediate postincentive decline, and participants did more of the math task without any additional payment—again, the opposite of what the intrinsic-motivation account would predict. We need more research to figure out when incentives would have no postincentive effects. But at a minimum, our findings strongly suggest that simply offering a temporary incentive does not necessarily harm intrinsic motivation. Instead, it seems that when people work harder because of an incentive than they would have without it, they just want to take a break afterward. Oleg Urminsky is professor of marketing and Beatrice Foods Co. Faculty Scholar at Chicago Booth. This essay is adapted from posts that appeared on his blog, Marginally Significant. James Andreoni, “Giving with Impure Altruism: Applications to Charity and Ricardian Equivalence,” Journal of Political Economy, December 1989. Joshua Angrist, Daniel Lang, and Philip Oreopoulos, “Incentives and Services for College Achievement: Evidence from a Randomized Trial,” American Economic Journal: Applied Economics, January 2009. Edward L. Deci, Richard Koestner, and Richard M. Ryan, “A Meta-Analytic Review of Experiments Examining the Effects of Extrinsic Rewards on Intrinsic Motivation,” Psychological Bulletin, November 1999. Roland G. Fryer Jr., “Financial Incentives and Student Achievement: Evidence from Randomized Trials,” Quarterly Journal of Economics, April 2010. Ellen Garbarino and Robert Slonim, “Pay-To-Perform Educational Policy: An Experiment Examining a Crowding Out Effect,” Working paper, March 2005. Indranil Goswami and Oleg Urminsky, “Figuring Out Preference or Balancing Out Effort: Do Inferences From Incentives Undermine Post-Incentive Motivation?” Working Paper, January 2018. ———, “The Dynamic Effect of Incentives on Postreward Task Engagement,” Journal of Experimental Psychology: General, January 2017. C. Kirabo Jackson, “The Effects of an Incentive-Based High-School Intervention on College Outcomes,” Working paper, February 2010. Mark R. Lepper, David Greene, and Richard E. Nisbett, “Undermining Children's Intrinsic Interest with Extrinsic Reward: A Test of the ‘Overjustification’ Hypothesis,” Journal of Personality and Social Psychology, October 1973.